In competition with the almighty Tough Mudder, the Spartan Race seeks to keep its racers engaged on a regular basis. In a fast-moving industry that is growing quickly, Spartan needed more than a good email system. It looked to Yes Lifecycle Marketing (YLM) and its multichannel communications platform. The Spartan Race franchise is one of the largest obstacle courses and endurance brands in the world. Spartan Race is a series of obstacle races of varying distance and difficulty ranging from three miles to marathon distances. They are held in the United States and have been franchised to 30 countries. The series include the Spartan Sprint, the Spartan Super, the Spartan Beast, and the Spartan Ultra. Spartan Race also has a military series, hosted on military bases. There are also winter and team events. 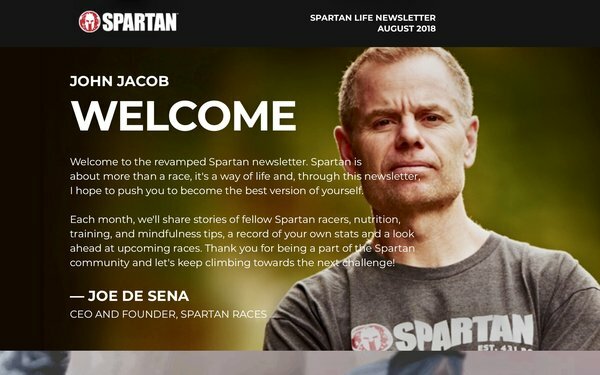 YLM created the Spartan Life newsletter to feed a legion of race enthusiasts and serial competitors who are hungry for content to help them succeed. The monthly email is a crucial touchpoint with fans and provides racers with inspirational stories from fellow Spartan athletes, training and nutrition tips, strategies for races, mind and body wellness guidance, gear recommendations and ways to connect on social media. Competitors see a personalized panel that includes their Spartan Race statistics and a scoreboard of recent race results to see how other competitors are performing. The Spartan and YLM teams created an email campaign for 400,000 subscribers. It included an offer to share a 20% discount for Spartan shop items with friends and family on social media. The email promotion linked to a landing page with pre-populated sharable content for Facebook and Twitter which, once posted, directed followers to a unique landing page where new subscribers could create a Spartan account and redeem their offer. After a follower signed up for an account, the Spartan subscriber who shared the link would receive a follow-up email with a 20% discount to use themselves. A 40% higher unique open rate than Spartan Race’s average open rate across all deployments. The acquisition campaign generated 28% higher open rate than standard emails and a 7% higher average order value. Facebook shares outperformed Twitter with 11% of them generating a new subscription vs. 7% of Twitter shares. A wealth of first-time orders. The new customers spent 4.5 times more than it cost to acquire them. A 353% return on investment with a single campaign. Spartan tied back the landing page visits, shares and subscriptions to each individual subscriber, allowing it to identify its most influential brand advocates and target them in future initiatives. Create a community of enthusiasts by offering content that they can use. Encourage social sharing to drive new-customer acquisition.